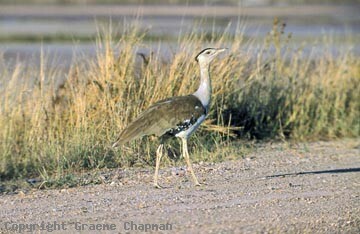 Australian Bustards are known widely as Plains Turkeys and this unfortunate alternative has put them on the menu of many country folks in the past, maybe not so much these days although some illegal shooting does still occur. 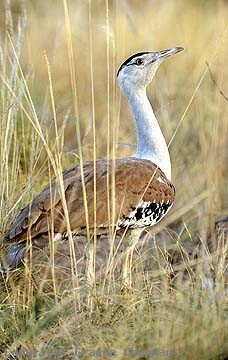 Nevertheless, the expanding human population has led to a great decrease in the numbers of bustards. 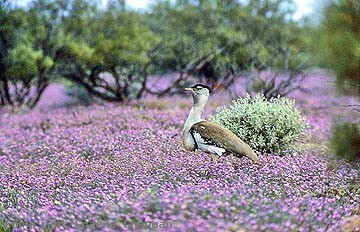 Once a familiar bird across inland southern Australia where they were even seen occasionally in large flocks, they are now restricted to northern Australia with occasional incursions further south to places like the Nullarbor Plain. 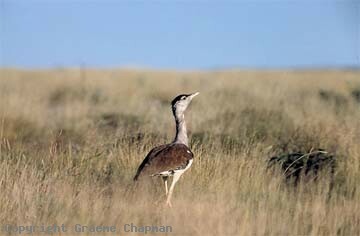 Bustards spend most of their time on the ground, out in the grasslands or in lightly timbered country. They occur singly or in small groups, venturing out to feed at dawn and at dusk on a wide variety of food - grasses and small fruits, a variety of arthropods and even small vertebrates like mice and lizards. When disturbed they normally walk very slowly away, head held high in haughty fashion though if pressed, they will take flight which is strong and can be sustained, taking them a long way. They tend to be nomadic, seeking out the good times that follow heavy rain. In dry times they may be found nearer the coast in more favourable places.